I grew up on a farm in southeastern South Dakota. This was when I first started learning about indigenous prairie plants. With a book on plants of South Dakota grasslands in hand, I'd explore our native river hills and learn the various plants. I also grew up with a vegetable garden, always interested in growing different vegetables. I've always found plants interesting, especially the native flora. In the past I had purchased typical perennials and watched them die in our hot summers. It made sense to me to use plants native to a region instead of exotic plants that were not adapted to the rigorous climate of Kansas. I started researching the topic, bought a few field guides for identifying Kansas wildflowers. I began searching for seed in road sides and public areas that fall. After a few years of experimenting, I learned how to grow wildflowers and grasses from seed; and incorporate them into my naturally landscaped yard. I learned what plants work well in the landscape and which ones were too aggressive. I also learned that some plants don't do well in cultivation and do not persist. As I became more interested in native wildflowers, I began to learn about our woody plants: trees, shrubs and vines. I expanded my yard to include many of these species - especially our native shrubs. This was the beginning to my passion for native plants. When I first started searching for various species to collect seed for propagation, I sometimes encountered a plant I didn't recognize. I would consult all of my field guides and usually determine what the plant's identity. When I couldn't identify a plant, I would take a pressed specimen to the herbarium at KU. The herbarium staff would help me to determine their identity. Over the years I kept increasing my knowledge and have become good at identifying unknown plant species. I also began taking pictures of plants I would encounter, mostly flowers. This lead to me cataloging my images. I put them on a website and am continuing to add to that. Use my Plant Identification Guide to see my images of plants found in northeast Kansas. Contract Botanist for the Chicago Botanical Garden and the Kew Millenium Seed Bank Project, 2006-2009. Made over 300 seed collections of native species of plants from the Tallgrass Prairie Region. 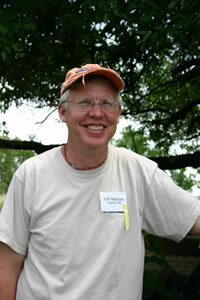 Contract Botanist for the Chicago Botanical Garden and the Dixon National Tallgrass Prairie Seed Bank, 2010-present. Made over 200 seed collections of native species of plants from the Tallgrass Prairie Region. Native Plant Landscape Evaluator, 2009-present. Since 2015 I started shooting videos of birds but later started making educational videos. I have a YouTube Channel called Backyard Birds that is dedicated to nature education. For over 20 years, I’ve been nurturing native plants, observing wildlife, feeding wild birds, and improving the habitat in my backyard. I want to share my knowledge with you, so you can learn and make improvements in your neighborhood. My videos instruct how to attract birds and other wildlife, demonstrate strategies to improve habitat, and teach about wild birds, beneficial insects & native plants. Crawe's Sedge (Carex craweii), The last time this sedge was seen in Kansas was 1897 in Shawnee County. A new population was discovered in Atchison County in 2017. Queen of the Prairie (Filipendula rubra), This rare fen species was never known from Kansas until I collected it in Atchison County in 2016. Loesel's Twayblade Orchid (Liparis loeselii), This orchid species was last collected in Kansas in 1899 from one location near St George, Kansas. It was presumed to be extinct in the state. I found a population of it in Shawnee County, Kansas in 2006. Earleaf False Foxglove (Agalinis auriculata), This species of plant was last collected in Shawnee County, Kansas in 1886. I found a population of it in 2002 in a park in Topeka. It is a globally rare plant, known from about 60 populations worldwide. Bent Spikerush (Eleocharis geniculata), This spikerush was never collected in South Dakota until I found it along the Missouri River in Clay County in 2015. Tall Boneset (Eupatorium altissimum), This species was never collected in South Dakota until I found it in Union County in 2014. Late Boneset (Eupatorium serotinum), This species was never collected in South Dakota until I found it in Union County in 2014. Purple Joe-pye (Eutrochium purpureum), This species was never collected in South Dakota until I found it in Union County in 2014. Hoary tickclover (Desmodium canescens), This species was never collected in South Dakota until I found it in Union County in 2014. Hairy Sunflower (Helianthus hirsutus), This sunflower species was never collected in South Dakota until I discovered a population of it in Lincoln County, South Dakota in 2012. By growing native plants, it has really opened my eyes to all of the organisms (mostly insects) that are dependent on our native plants. The insects go on to become food for other animals like our many song birds. In 2011, I was excited to find a species of butterfly in my garden that had never been seen in Shawnee County before. It is known as the red-banded hairstreak. It likely fed as a caterpillar on the aromatic sumac that grows in my yard. I took photos of it and submitted it to Butterflies and Moths of North America (BAMONA) and it is now a Shawnee County record! Here are details of the sighting on the BAMONA site. Another Shawnee County butterfly record that I encoutered was the Phaon Crescent, seen at the Kansas Children's Discovery Center butterfly garden, which I designed. The butterfly was featured in an article the Topeka Capital Journal. With all the native plants and insects they attract, my yard has become a paradise for birds. To entice cavity nesting birds, I've put up many kinds of nest boxes (bird houses). I've successfully had house wrens, carolina wrens, chickadees, bluebirds nest in my smaller nest boxes. I've even had great crested flycatchers and flicker woodpeckers nest in my nest boxes. You can learn more about my experiences with Cavity Nesting Birds. My first experience with papermaking was in the late 1990's using recycled junk mail. After reading a description of making paper from plant fiber, I tried iris leaves from my garden. Years later I was re-introduced to making paper from various native plants by artist Betsy Roe. I began experimenting with various native plants. The results of his experimentation are some incredible plant fiber papers. The natural colors and textures make for an interesting variety of papers. My Plant Fiber Paper site explains more about this past time.